The new Apple iPad has finally arrived bringing with it a hi resolution Retina Display, quad-core graphics A5X processor, better connectivity and an improved camera. Read the new iPad review and you won’t be dissappointed. 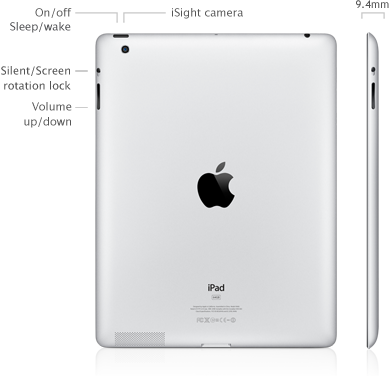 There are several facts we all know and the new iPad review which buyers will do will reflect the ‘new iPad’. One is the iPad faster processor, this is as we suspected the dual core Arm processor, Apples A5X with a quad core graphics processor. The all new retina display which was widely predicted for the iPad 2, will undoubtedly set it apart from the competition and bring it into line with the iPhone 4 and 4S, which do currently support the retina display. With a resolution of 2048 x 1536 on a 9.7-inch display, the spec is double the vertical and horizontal pixel count of the current iPad, whose resolution is 1,028 x768. This in fact produces four times the actual resolution, since area varies as the square of the dimensions, this is because you are doubling the resolution both horizontally and vertically. 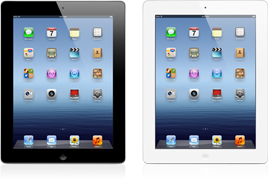 The new iPad (iPad 3) prices are comparable with those of the iPad 2 when it made it debut. Other features which have been announced is a bigger battery to cope with with faster processor and graphics and obviously the retina display. The Ipad has also shown a clear requirement for a decent camera, this has finally come in to realization. A 5 Mb camera with face detection and autofocus, the iSight camera has been a welcome feature. Also HD video recording with image stabilization 1080p, recording at 30 frames a second. The front camera is for video chatting and although the quality is no where near the rear camera it is adequate as a VGA camera for facetime / video chatting. Dimensions of the new iPad are same the the iPad 2 except for the thickness which has increased from 0.34” (8.8mm) to 0.37” (9.4mm), obviously to maintain the10 hour life of the iPad that we have been accustomed to with the iPad 2. Even with a slightly larger battery, the battery life of the device is maintained: about 10 hours. That is due to the fact that Apple have quadrupled the screen resolution, have a faster processor better graphics which run smoother all of which requires more computing power, hence the larger. More power, more power..that is what the new iPad hungers for and Apple have designed a battery to feed it. New iPad review have confirmed that battery is 70% larger than one in the iPad 2, it is a massive 42Wh (11,666mAh) in capacity compared to the iPad 2’s which is a 25Wh (6944mAh). As mentioned above, the obviously higher resolution and brighter Retina Display, LTE chipset and faster processor will require more power. Apple have managed to enclose a much larger battery into a chassis which is less than a millimetre thicker that the ipad 2. By increasing the efficiency of the lithium cell technology in its phones and thereby bringing this to the iPad. Had they not done so the battery life on the new iPad would have been drastically reduced by about half. However since Apple had previously set a precedent and therefore the expectations of users of a minimum 10 hour battery life, a thicker tablet was called for and the result was a barely perceptable thicker tablet emerged. The new iPad is however, still much thinner than the original iPad which was 0.582” (13.4mm). Although many won’t want to replace their camera with an iPad the 5MP camera does give you the choice of taking a decent photo or not. A luxury the iPad 2 didn’t share. The new iPad Review can confirm that prices have taken into account the newer technology and have therefore priced the new iPad to reflect this. Together with the new iPad’s improved 5-MP iSight camera with face detection and auto focus it can also record. The 5 Mb iSight Camera is more than enough to satisfy most users, several of the features which are incorporated into the new camera make taking pictures easy and good pictures easier. Auto exposure and auto focus together with the backside illumination sensor will ensure that in most light conditions you’ll get a decent picture. On top of this Apple have added face detection Built-in face detection that automatically balances focus and exposure across up to 10 faces. The ƒ/2.4 aperture and a five-element lens, hybrid infrared filter keep out harmful infra-red light ensuring more accurate color interpretationand uniformity. These filters are generally reserved for expensive SLR cameras, so innovative of Apple to incorporate it into the new iPad. Unfortunately front camera which is used for FaceTime calls hasn’t been upgraded we are stuck with VGA low res quality. New iPad reviewers have said that one disappointment regarding the new iPad has been the inability to make Face Time calls over 4G, there are only available over WiFi. Even though Android devices have been able to make video calls for over a year over 4G, we surmise that this is due to the heavy data usage the calls make.